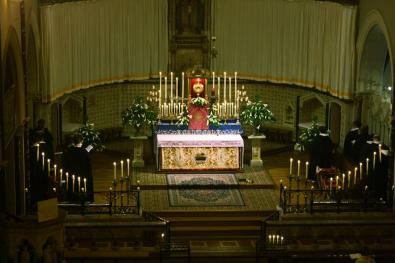 On Friday our Forty Hours began with a Solemn Mass of Exposition. Our Holy Father St Philip used to say that everything that was good in him he had learnt from the Dominican Fathers at San Marco in Florence. In Rome he would take the Dominican novices on picnics, and was given the key to the Church of the Minerva so that he could let himself in to Compline there. It was at the Minerva that the Forty Hours was held to pray for a favourable judgement on Girolamo Savanarola. St Philip, who had a great devotion to Savanarola, stayed praying for the whole forty hours - but fell into an ecstasy. When he came round, he declared that the thing for which they had been praying had been granted. It was later discovered that the Pope had judged in favour of the Dominicans at just that moment. It seems highly appropriate then that the Dominicans should come to pray Compline during our Forty Hours, and we may hope that our own prayers before the Blessed Sacrament may be just as efficacious! 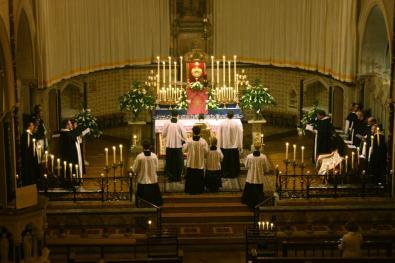 The night vigil continued, with Matins and Lauds sung by the Sisters of the Work and then Mass at 6pm. 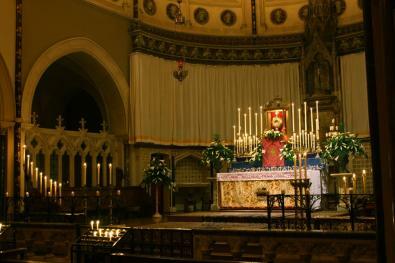 This evening there has been a Mass for Peace and the church closes at midnight. The Blessed Sacrament will be exposed again after the Solemn Mass on Sunday 14th - of the Sacred Heart - and the Forty Hours will conclude with Solemn Vespers, a Procession and Benediction at 5pm.